It’s never too early to start youth football registration. Make sure your board is putting the building blocks in place now to have a successful season next year. We’ve got a few quick tips on how to register more youth football players next season. 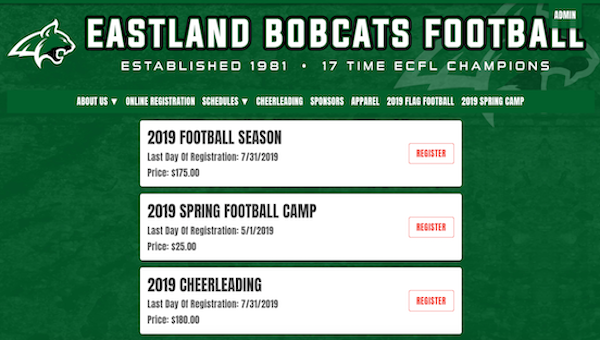 It’s super important to give parents convenient options to register for your youth football program throughout the year. If you wait until the summer or right before your season begins, parents will have already found fall sports opportunities for their kids. If you’re having a post season banquet, be sure to build excitement for next year and encourage parents to get registered right away. Also, don’t worry about making parents pay up front for the entire season now. You can give them a simple option to make a deposit and pay their balance as you get closer to next season. It’s also easy to open online registration now for next season, even if you don’t expect most parents to register until the spring. Incentives like Early Bird Discounts and small deposits or payment plans can help get players in the door early for next year (see tips below). This the year to start a flag football program if you don’t have one already. Flag football programs, particularly for younger age groups, is growing quickly across the United States. If you have a middle school tackle program, consider starting a flag football program for younger kids in grades K-5. A strong flag football program will lead to higher participation levels in your tackle program in future years. Getting a successful flag football program started will go a long way to increasing participation. The flag program can just be a team or two at first and is inexpensive to get started. Starting from scratch? We’ve got more info on how to start a flag football league. A huge challenge in preparing for the season is knowing how many players you’ll have. If you wait until the summer months to get commitments from players it will be difficult to budget for the season, manage volunteers, and recruit the proper amount of coaches. The main challenge with getting parents to commit early is that it’s tough to get people to pay up front for the season more than 6-months in advance. But, you can give them the option to make a small deposit early (say $20) and schedule the remainder of their balance in the summer as the season gets started. That way you have a solid estimate on the amount of players you’ll have, parents don’t have to make a big financial commitment well ahead of the season. You also don’t have to worry about chasing down cash and check when the season is starting. If you set up an automatic option for parents to put down a deposit now and auto pay for the rest of the season later, everyone wins. Take a lesson from college football and run a quick spring program to keep the momentum going into next season. A short camp-like program is perfect for a few weeks in the spring. The spring program can be super informal and just an hour or two per week. You don’t need any equipment other than some footballs and maybe some flags; everything in your spring program can be non-contact and focus on speed and skill development. It’s also a great opportunity to get new players interested that have never played football before, or to get new coaches involved. Be careful not to cannibalize other sports in your community though! You’ll need kids that play baseball or lacrosse can participate in your spring programs, just make sure your events are on a slow night for other sports since their primary season is in the Spring. Be nice to the other sports and they’ll share their list of participants with you and promote your organization. Looking to get crazy? Running an ad in the local newspaper used to be an easy way to get the word out about your organization. But it’s a little tougher now because very few parents are reading the newspaper every day. 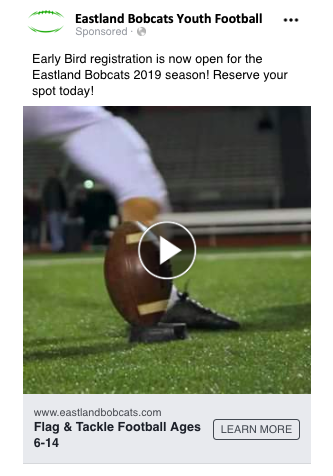 Setting up simple ads to use on Facebook or other social media channels can be quick and inexpensive to promote your football program to new players. This can be particularly effective in reaching parents whose children are just becoming old enough to participate in your organization. Worried about wasting money? You can spend as much or as little as you’d like with an Ad on Facebook. Try spending a few dollars per day and see if you get any additional Likes, Shares, or Comments from people in your community. As you start having success you can start spending a bit more per week. Running a successful youth football program is a year-round endeavor. Don’t put everything away and wait until next summer. If you take some time to get your 2019 football season organized now you’ll find yourself with more football players next season across your flag and tackle programs. Trying to get more youth football players registered for next year? At Jersey Watch we help football programs manage their websites, registration, online payments, and communication. If you’d like to learn more or get started you can visit our website at www.jerseywatch.com/football or send us a message at help@jerseywatch.com.